In addition to the ongoing robot competition at AVC 2013, we included some carnival-type entertainment for the attendees. We rented a dunk tank, triggered it with a swiveling mallet, and challenged people to play "Trampoline Simon Says". This year's AVC was held at the Boulder Reservoir. We knew it was going to be a hot day and we'd be in the sun for a good 8-10 hours. So we thought, "What better way to cool off than a dunk tank?!" Our dunk tank idea quickly grew into a much bigger DIY hack job. 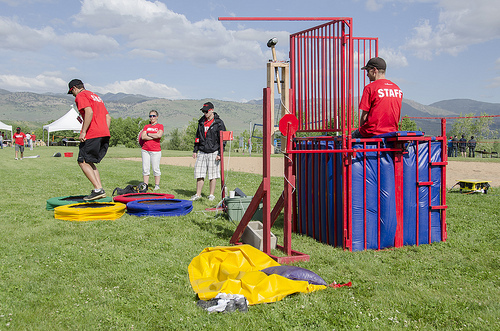 We thought, "Why not get rid of the bean bags and softballs and, instead, trigger the dunk tank drop using a Simon Says game? Why not replace the buttons with trampolines?" Just a few days before AVC, I ran into Nick Poole in the lunch room. In true "over the water-cooler" fashion, I asked, "Hey Nick, how's your swinging mallet apparatus coming along?" Nick was in charge of the triggering mechanism for the dunk tank. His approach worked beautifully and had just the right amount of functionality and danger. He planned to use a heavy mallet on a hinge. It would be held upright (just slightly off of vertical) by a servo arm. When the servo arm moved out of the way, the mallet would rotate downward and seriously smack the dunk tank trigger. While Nick was in charge of this mechanism, I was working on a new rendition of Simon Says. I wanted to change the buttons to trampolines. This way, the player would be challenged to jump the pattern. I also wanted to change the buzzer sounds into musical sounds. Ultimately, I used our Musical Instrument Shield and triggered some MIDI drum sounds. Back at the water-cooler... Nick and I discussed how the Simon Says trampoline game would communicate with the mallet trigger. We decided that a simple digital logic would be the best approach. When someone won the game, I would send Nick a signal that would be pulled low for 3 seconds. On Nick's end, he would wait for a signal to drop for at least 2 seconds. He would also use the internal pull-up resistor to keep the signal high (in case we lost connection). We thought it best to take all precautions we could. There's nothing worse than getting falsely dunked. After we had the communication worked out, then it all came down to a little code tweaking and a ton of soldering for me and a little bit of carpentry for Nick. The final project turned out to be quite a success at the event. Best of all, it continued to work. Yay for successful "demo days!" All that careful soldering and hot gluing had paid off. 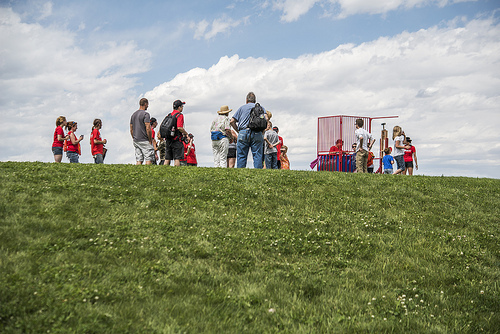 There was a line of people all day, waiting to get their chance to dunk someone. In the morning, one of our entertainment crew members, Abbas, cruised around the grounds and politely asked people if they were interested in getting dunked. We were surprised at how quickly the list filled up. Nice work, Abbas! And thanks to everyone who was dunked. Even our very own Queso Grande, Nathan Seidle, was dunked! Being the original engineer on the Simon Says game, Nathan told us that his splash came as a big surprise. He was expecting 13 jumps before getting dunked. The original Simon Says game required the player to remember pattern of 13 steps in order to win the game. He was totally unprepared to get dunked at just 8 jumps. Sorry Nathan, we had to modify your original code a bit. It turns out that getting to 13 jumps on 4 separate trampolines is pretty challenging! Thanks again to everyone that came out to AVC. We hope you enjoyed the competition and extra installations. 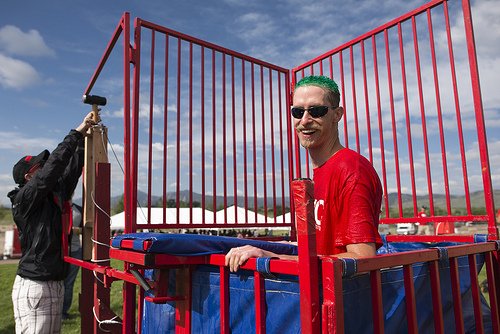 We look forward to running the Simon Jumps Dunk Tank again next year, along with any new hacks that come to mind! Anyone up for a slip-n-slide speed contest? Want More Info on SparkFun Classes/Workshops? How did the dunker get the light sequence from Simon. Also I notice a bunch of USB cables Was that just part of the trampoline? Power maybe for the trampoline sensors? I love the sledge hammer of death, btw. Too bad it couldn't automatically reset itself, but the dunk tank needs resetting anyway. So then I tried some of our super-bright LEDs. I wired up 6 of them per trampoline and maxed out their allowable current using our Mosfet Power control kit. It is terribly blinding when you look directly into them, but this was the only way that it had a chance to be seen outside under the sun. Also, you're right about the USB cables. They were just a means of carrying power and two signals to each trampoline. I had GND, 5V, trampoline trigger signal, and LED ON/OFF signal. If I were to do it again, I think I'd go with Ethernet cables and possibly make it daisey-chainable. But for this hack, we were a little pressed for time and once I committed to USB, I just had to keep going in order to finish in time. Ahh speed hacking... what a rush! Man, I missed something that utilized a mallet, simon, trampolines and a dunk tank?! I'll have to make sure I can attend AVC next year! Mallot? Hell that's a freaking "Sledge-o-matic"! You know while you were at it, you should have made the thing a bit more "Rube Goldberg". this is awesome! and I bet the hammer made a nice sound too. but what did you use to detect jumps? In terms of detecting the jumps, I really lucked out with the trampolines. I found four exercise trampolines that included a trigger mechanism. For exercising, they were used to count your jumps and tell you a bit about your calories burned and workout times. From the pictures on the outside of the trampoline box, I wasn't sure how hard it would be to use the included trigger. It turns out it was a simple hardware switch. The mechanics were brilliant. It used an arm touching the bottom of the tramp. When the arm moved down, it caused a momentary connection between the two contacts. Simple and reliable. The switch contacts were already terminated to an 3.5 mm audio plug. This made it even easier to connect into my system. Besides a slight change in the debounce, the button functions in the code required no change. Save the Date: It's officially AVC season 2017!